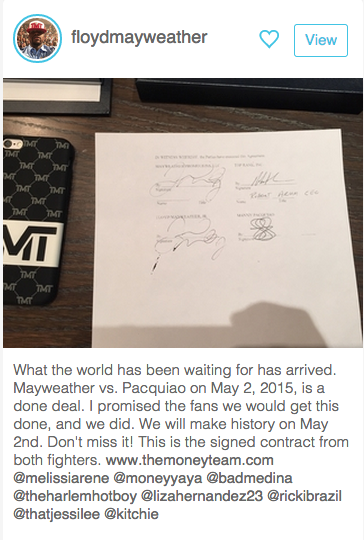 Floyd Mayweather vs Manny Pacquiao On May 2nd, CONTRACTS SIGNED!! What the world has been waiting for has arrived. Mayweather vs. Pacquiao on May 2, 2015, is a done deal. I promised the fans we would get this done, and we did. We will make history on May 2nd. Don’t miss it! This is the signed contract from both fighters. So this is it, Floyd Mayweather vs Manny Pacquiao will be the biggest fight of our generation, period. Nothing comes close to it, and we were so close to being denied it when “Pac Man” got banged out by Juan Manuel Marquez in their fourth meeting. Many claimed “Money” was avoiding the fight, but it looks like the negotiations met a smooth conclusion. May 2nd in Las Vegas, Nevada. 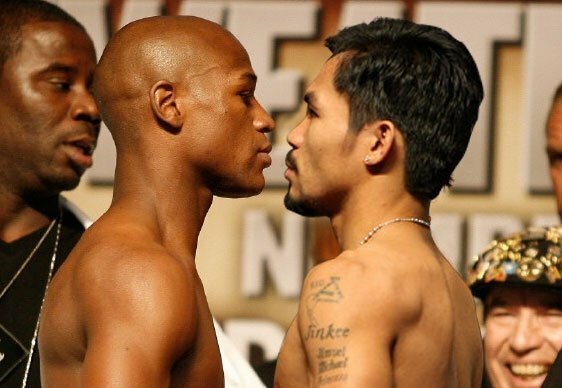 Each man is expected to make over $100 million for their part in this historic fight.